Terrence Garner ’17 goes up for a shot against Monmouth. The junior guard has never experienced a conference loss as a Green Knight. The last time the St. Norbert men’s basketball team lost a Midwest Conference (MWC) game, Terrence Garner ’17 had just poured in 25 points for Oak Creek High School in a victory over Racine Horlick; Ben Bobinski ’17 was adding to his all-time scoring record at Green Bay’s Notre Dame Academy; and D.J. DeValk ’18 was the sixth man for the state-bound Little Chute Mustangs. 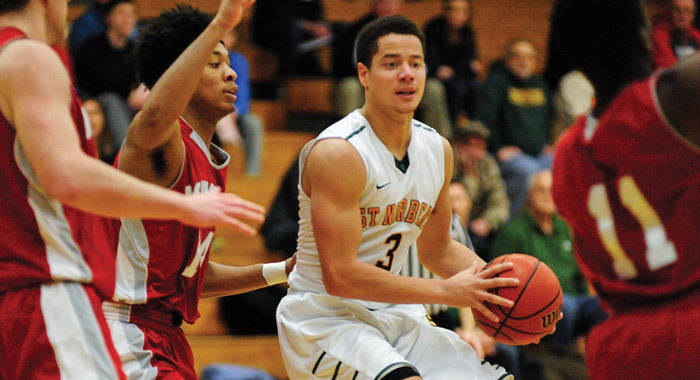 The tri-captains and no other current Green Knights were on the roster when St. Norbert fell 104-99 in overtime, Feb. 9, 2013, at Grinnell College. The adage that a loss is good for a team is of no interest to the players. Since press time in early March, Green Knight basketball has continued its push for glory. The men’s team has extended its record-setting streak of conference wins to 64, winning its conference outright along with the privilege of hosting the season-ending tournament – at which the team qualified for the NCAA Tournament. At pixel team, the team was headed to the Sweet Sixteen for the first time since 1984, following victories over Northwestern-St. Paul (77-58) and St. Olaf (63-61). Coach Gary Grzesk was named the Midwest Conference Coach of the Year for the fourth consecutive season, becoming the first coach in league history to accomplish the feat. The 2016 honor was Grzesk’s fifth overall MWC Coach of the Year award. The women Green Knights continued unbeaten through their season, also hosting their season-ending tournament and powering through to the NCAA Tournament. The team fell to George Fox University (64-54) in the first round of the national contest. Readers can keep up with the men's progress at www.snc.edu/athletics/basketballm. The men are not the only team on a conference winning streak. The St. Norbert women’s basketball team has not lost in MWC play since Jan. 24 of 2015 – and that, itself, was the team’s first conference-game loss since January 2014. This season, the squad has outscored conference foes by nearly 20 points per game en route to its third consecutive MWC title. The team finished undefeated in Midwest Conference play for the first time since 1989. 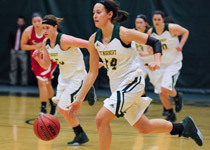 Mid-February, St. Norbert was the only school in Division III to have all four of its winter sports teams – men’s and women’s basketball, men’s and women’s hockey – regionally ranked by the National Collegiate Athletic Association. It was a better-than-half-court shot so desperate and inspired that it made ESPN SportsCenter’s Top 10 plays of the night. As the first half of the Dec. 2 men’s basketball game against Ripon expired, Ben Bobinski ’17 launched a 65-foot three-pointer that put the Green Knights up 29-27 at the half, for an ultimate 59-57 win.